トルーマンの選挙運動のキャンペーン歌 "en:I'm Just Wild About Harry" 時間 3:54. ^ Hugh Alvin Bone, American Politics and the Party System, p262 (McGraw-Hill 1955). ^ Donaldson, Gary A. (1999). 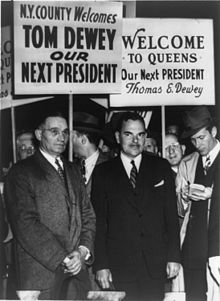 Truman Defeats Dewey. The University Press of Kentucky. p. 173. Quoting The (Louisville) Courier-Journal November 18, 1948. Divine, Robert A. "The Cold War and the Election of 1948,"
Donaldson, Gary A. (1999). Truman Defeats Dewey. University Press of Kentucky. Gullan, Harold I. (1998). The Upset That Wasn't: Harry S. Truman and the Crucial Election of 1948. Karabell, Zachary (2001). The Last Campaign: How Harry Truman Won the 1948 Election. Mosteller, Frederick (1949). The Pre-Election Polls of 1948: Report to the Committee on Analysis of Pre-Election Polls and Forecasts. Social Science Research Council. Reinhard, David W. (1983). the Republican Right since 1945. University Press of Kentucky. Schmidt, Karl M. (1960). Henry A. Wallace, Quixotic Crusade 1948. Syracuse University Press. Neal, Steve (2003). Miracle of '48: Harry Truman's Major Campaign Speeches & Selected Whistle-Stops. Southern Illinois University Press.